Preparation for a life of celibacy is one of the primary aims of the human formation program. Through a program of instruction, prayerful discernment, dialogue, and personal integration, seminarians come to understand the nature and purpose of celibate chastity. “Human formation for celibacy should aim toward an affective maturity which is the ability to live a true and responsible love. Signs of affective maturity in the candidate are prudence, vigilance over body and spirit, compassion and care for others, ability to express and acknowledge emotions, and a capacity to esteem and respect interpersonal relationships between men and women” (PPF #92). 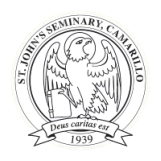 The seminary has created the St. John Vianney Conference which is designed as a holistic integration of the virtues necessary for the seminarian to embrace freely a life choice for celibate chastity. The program consists of conferences which highlight the three qualities of Simplicity of Life; Celibate, Chastity, and Obedience. Throughout their years of maturation through the seminary formation program for celibacy, each level of formation is assigned an area for reflection and integration. Pre-Theology students participate in a two-day “Introduction to Seminary Formation” which emphasizes transition issues, the meaning of seminary formation, and the seminary’s Rule of Life. First Year Theology students participate in a three day conference that highlights human sexuality and celibate chastity. Fourth Year Theology students are also participants and take a leadership role as group facilitators. Second Year Theology students gather for a two-day conference on Obedience. Third Year Theology students gather for a two-day conference on the meaning of Simplicity of Life. The St. John Vianney Conference Handbook is a compilation of the materials and activities used during the conferences. The Handbook is intended as a resource for ongoing reflection. Developing the habits for integration of the seminarian’s psycho-sexual development, morality, affective maturity, spirituality, and the call to Gospel values are emphasized during all aspects of the conference. Building upon the St. John Vianney Conferences, the seminary utilizes a variety of means to facilitate ongoing reflection and integration. The Intensive Period of Spiritual Formation (IPSF) is a month long experience that considers many areas necessary for healthy human and spiritual formation. IPSF A is offered during the summer of First Year. This period of spiritual formation highlights areas of identity and development, forms of personal and communal prayer, and includes a week-long directed retreat. IPSF B lends its focus on the specific reflection on the impact of diocesan priestly spirituality and its importance for seminary formation. Reflection on developing and integrating a diocesan spirituality, with an emphasis on celibacy, simplicity of life, and obedience is again reviewed and appropriated.